This mod takes a differential that could only send 2 times the torque of the other end of the car that is slipping up to 4 times the torque of the other end of the car that is slipping. It will allow you to send upwards of 80% of the torque to the end that is slipping. This is useful in situations like an auto-x where you are attempting to make it around a turn faster and normally once you loose traction, you will continue to go straight whereas with this mod, you will be able to induce over steer and correct. The nice thing about this mod is that for daily driving where you are not in a situation where you are trying to hammer through turns, the car will drive and behave just like stock utilizing the static 50/50 bias. It makes the car more predictable and agile. The torsen bias will mimic that of the Audi RS4 which comes from the factory with this bias. No warranties expressed or implied. This information is for educational purposes only. I am not liable or responsible for anything you do. By reading this article, you are in agreement with the aforementioned terms. This article is specifically written for the facelift style (99.5 to 01.5) Audi A4 1.8T Quattro with a manual transmission. All photos are from a 2001 Audi A4 1.8T Quattro with a manual transmission. Granted these instructions can be used for other models as well because the idea is very similar but keep in mind that it is directed specifically at the A4. Replication of any portion of this site including (but not limited to) it's HTML, Images, etc. is strictly forbidden without the expressed, written consent of its author. Here's an excellent step by step video tutorial that another user on VWVortex put together that I wanted to share as well. I didn't make the video but it's a great watch and super helpful so I wanted to include it here. Make sure you are on a level surface and begin setting up by jacking up the car at all 4 corners. It's important to be on a level surface to make sure that you can drain the transmission and once you are done, refill it with 3.5 quarts of gear oil. Checking to make sure you can open the fill port is important because once you open the drain port; you are not in a good spot if you cannot open the fill hole. Remove driveshaft heat shield. There are 4 10mm nuts to remove. Remove driveshaft to center differential bolts. There are 6 8mm allen bolts to remove. I would recommend using an impact gun because otherwise you will need to put the car in park to wrench them off and frankly, it's a pain. Remove driveshaft. Sometimes you get lucky and the driveshaft will slide away from the differential but in most cases you will need to pound it with the rubber mallet to remove it. I found that putting a small flat head screwdriver in the lip of the driveshaft and hitting it with the mallet works the best. Put a rubber glove or a plastic bag over the end of the center diff and the driveshaft so you can keep from getting dirty. Remove the center differential cover. To do this you will need to insert the pry bar between the transmission case and the center differential case and gently work it off. Be careful not to let it fall off the input shaft when you get it loose. Remove snap ring from the bottom of the center differential housing. Have a good set of snap ring pliers otherwise this will not be fun. Remove rubber plug from bottom of the differential housing. Do so by inserting 8mm x 1.25 bolt into the center of the rubber plug and pulling it out. Make sure you clean off any excess metal shavings from the magnet. Keep in mind that there shouldn't be much (if any) metal shavings but clear them off if there are any. Remove the torsen from the spline. To do this, you will need to gently tap the torsen off the spline. I used a socket extension and the rubber mallet but you can use a wooden dowel and a rubber mallet if that's easier. Be careful not to damage the spline. Be careful with these. I'm not sure where you would get replacements. Tap the top of the Spirol pin. The key to using a tap is to go slow and use plenty of oil. Make sure the threads are clear by using brake clean or something similar. Attach vice grips to the end of the screw and hit the vice grips with a mallet until the pin comes out (repeat for the other two). Mark the gears against the torsen body so that it will be easier to re-assemble. I marked each side and also marked the gears against the housing so assembly will be easier. Use a white-out pen and you will be just fine. Now slide out the large pins holding in the outside gears and they will literally fall right out (be careful). Once one set of outside gears is removed you can access to the middle stack of gears which is what you need. Carefully slide the middle stack of gears without altering the orientation (don't flip them around... keep the bottom gear on the bottom and the top on the top). Also make sure not to lose the position of the washers. Time to swap out the washers. 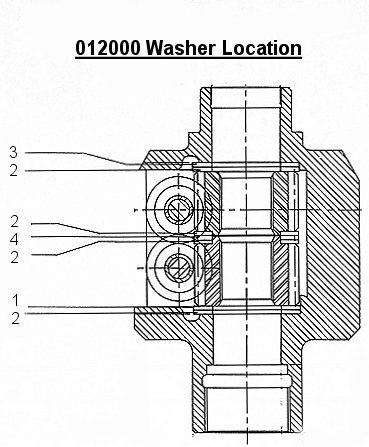 Refer to the torsen diagram to see the washers you will be replacing. You are going to be replacing the washers #1 & #4. Please be aware that at the bottom of the differential, washers #1 & #2 are swapped in Audi differentials when compared to the torsen diagram listed below. So when you pull it apart, one washer will be at the very bottom of the stack and the other will be exactly in the middle. 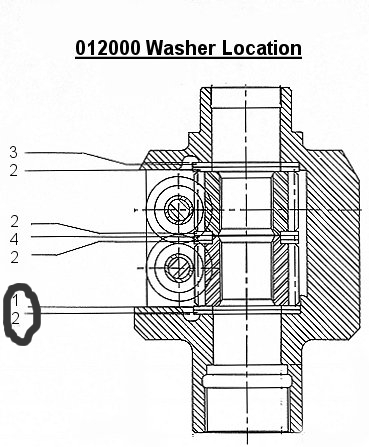 When you place the washer in the bottom position (#1), you will need to make the bevel in the washer face down so that it sits flush with the lip. If you put it in wrong, the gear stack won't go in so don't worry about messing it up. 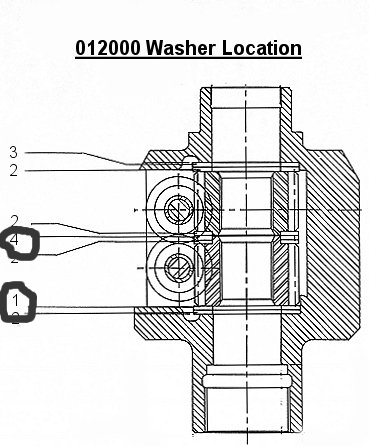 As for the washer you are replacing at position #4, the bevel does not matter. Now it's time to place the inner stack back into the Torsen. It should slide in freely without binding. Once it's in, place the outer gear set back in and insert the large pins back in to hold the outside gears. Check and double check to make sure that the gear set spins freely by hand. Then place it back on the spline in the center differential cover and check again to make sure that it is spinning freely. As long as everything is spinning freely, time to put it back together. Enjoy your new 4:1 diff! If you really like this write up and want to donate $5 to help with server expenses, please click below.